Photo of me, Lisa Nolan, at age 2 1/2. 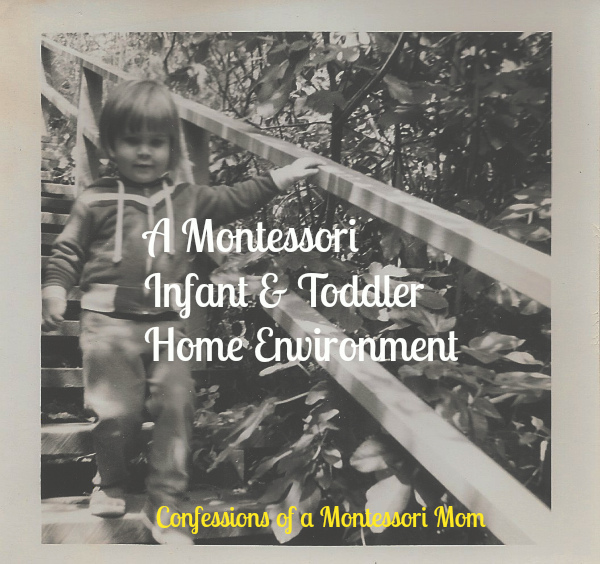 I get a lot of questions about how to do Montessori at home with infants and their toddler siblings. So I created a Montessori Infant and Sibling Series. This is part one. How do I organize the work room areas (where all the Montessori-related materials are going to be) including a two-year-old area (such as art section, math section, etc.) and an 11-month-old area of the room? What about their bedrooms and the living room? Which room should I start with first? It's just overwhelming. Should I make up a daily schedule first, or organize (plan, shop, and display) all the materials first? And how do I decide what I should put on the shelves for each of my children? A Montessori infant and toddler school (and non-Montessori school) will have two classrooms, and the toddlers can be in the infant classroom (like before and after school like at daycare time) but the infants do not go in the toddler classroom. So you will have circle and or story time and snack/lunch in the infant area. For the infant area (0-18 months) of a "Montessori material" room (the room where you have your infant tot Montessori activities) you will need a changing table/area, a low table like a coffee table, and stools, no art--yet. And if you want you can have shelf categories like 1) language and math, 2) practical life and sensorial, 3) music and misc. like puppets, stuffed animals, paper. You can add a Montessori Treasure Basket Activity, and change the (large) objects every week or two, and also a baby mirror, and a safe, stand-alone mirror--they are expensive though. Also, looking ahead at 15 months and up (or now if you have a potty-trained toddler), you can add a potty chair. When your infant turns 15 months, you can add a dressing area/basket for putting on and taking off shoes and socks. For your Montessori toddler shelves for 24 to 36 months (separate from your Montessori infant area): Any Montessori-based activities (ones that you would most-likely give a lesson on, rotate, and keep organized on shelves). In a non-Montessori room (play room or living room or family room): A tunnel, a play kitchen if you like, any non-Montessori pretend play and loose-ended toys, dolls, and bean bags, etc. Eventually you can do Montessori Walking on the Line in the infant area or non-Montessori area/room. Or create your own movement program with CDs you have at home or can get from the library. Keep it simple, and do a seven to ten minute movement time to start, and build up to a 15 minute movement time over time (six months). Bedrooms have quiet non-Montessori activities and personal items like favorite stuffed animals, photos of family, your child's arts and crafts that he made, as well as age-appropriate books. Non-Montessori bedroom activities could be blocks, Legos, trains and tracks, etc. Also potty chair, and safe mirror for self-dressing. No musical instruments or noisy toys go in bedrooms. Your toddler can have a choice to be in his bedroom or in the infant area for "quiet playtime" (no musical instruments or noisy toys/activities should be used during nap time). What I recommend to moms with young children at home is to schedule at least 40 minutes each night to working on your Montessori home environment (when your children are asleep). And since you have two children, use 20 minutes for each of them. What I mean by that is this: set a timer for 20 minutes for child #1 and begin working (it could be organizing, gathering activities like books, creating an activity like the Treasure Basket, going on line and looking for an item you want to buy, etc.). Then, when the timer goes off, set it for another 20 minutes for child #2 and begin working. Do this for a month or two or longer. Of course, you can do another 40 minutes! Set the timer again and repeat the above. Where to start? Start with what you already have. In a few days, start with what you can make and begin making activities with materials from home. In a few days or weeks, start ordering activities on line, using a monthly budget (only buy what your monthly budget can afford). You don't need to make and buy everything all at once, you will spread it out over time. As for a daily schedule, you can begin one after the holidays, a schedule built around morning snack, a circle or song or story time, an outside playtime, lunch, etc.